I would suggest an AEM dryflow drop-in (#28-20395) instead of the K&N. There have been many reports of the oil on the K&N causing issues with the Mass Air Sensor. Did you notice any loose rubber/plastic on the filter? I have seen reports of loose pieces in the filter and mold flashing (pieces of material left on from the molding process). I found a post where he inquired about curved LED light bar but nothing further. FYI, the Forum has a thread on light bars; 5th Gen w/LED Light Bars..... Unfortunarely some of the pictures are gone because a 3rd party hosting site was used instead of the forum's servers. Got the windows tinted today. Looks KILLER! Should have done it a long time ago! Also replaced the factory halogen fog lights with the LED ones suggested on the forum here and they match pretty decent. Is there supposed to be a picture? there think i fixed it!!! Subtle little touches. Painted the calipers yesterday. Didn't take long and I think added just a little bit extra to it! Also shows how well the tint matched up! Almost stock 2013 eco boost limited. Like to share my 2013 “almost” stock Explorer 2.0L limited. Nice job! It's very striking! The day we got our 2018 Explorer Sport. Have since tinted the front windows, but need to take updated pics. Hope everyone is doing well today. 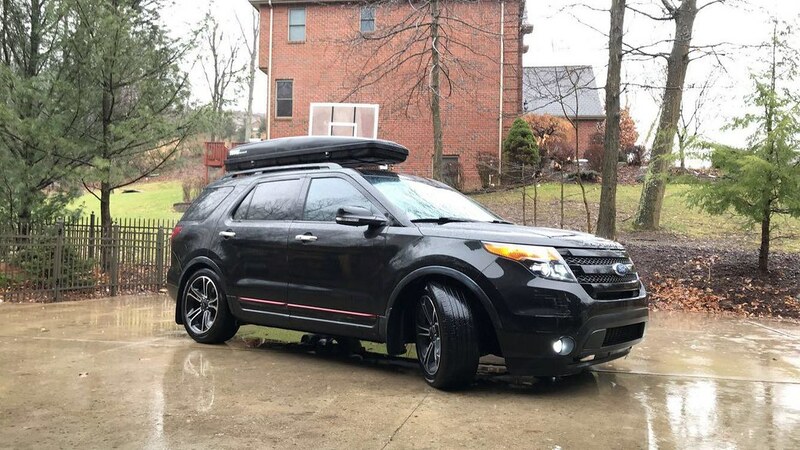 Wanted to ask if anyone has added the "Explorer" script to the front hood like what comes on the sport. Been thinking about adding that. I have the chrome rings for the fogs, just haven't decided yet if I want them on or not.